It may be three months into the year, but the winter chill and drizzly mornings are clinging on and refusing to budge! Some late winter warmth is the perfect pick me up if you’re craving some sun and relaxation. Trade damp and dull weather for dazzling skies over an inviting golden beach during your villa holiday. Year-round warmth is just a short flight away, with many sun-kissed destinations sitting at a delightful 22°C in the late winter. Take a look at our top villa holiday destinations for March. Jet off to warmer climes and enjoy a memorable villa holiday on this radiant Canary island. You’ll be truly spoilt for choice! 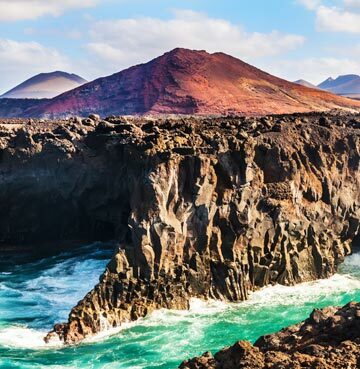 Not only does Lanzarote show off some incredible coastline, it’ll also dazzle you with its diverse landscapes. Bask in glorious temperatures of up to 22°C in March. Enjoy a range of tempting bars and restaurants at popular resorts or venture out to explore the island’s striking natural beauty. Playa Blanca, based in the south of the island, has made a name for itself as a relaxing and tranquil holiday destination. Soak in the sun during a walk along its fine marina, and admire the views of the impressive yachts floating on the ocean’s calm surface. Take your pick from over 50 homely villas in the area! Known to be livelier than Playa Blanca, Puerto Del Carmen boasts 6km of beautiful beach and has become a bustling area for holidaymakers. Alongside these buzzing resorts, natural Lanzarote is waiting to be discovered! Volcanic landscapes are aplenty, with 300 volcanos strewn across this intriguing land. You’ll be mesmerised by the stunning sight of the red sand and lava formations at Timanfaya National Park. Discover the cave ways and magma settlements on a day tour, allowing you to immerse yourself in the atmosphere. The red sandy views promise to whisk your imagination away! The Canarian gem of Haría sits in the north, and shines with a quirky personality. Picturesque views of little white houses dotted on the hillside are a real treat for the eyes. If you fancy a bit of water adventure, Famara beach is an idyllic spot for surfing and other watersports. The wind from the Atlantic creates the perfect conditions for you to relish a lively day at sea, with a backdrop of breathtaking cliffs. An island as unique as Lanzarote promises to leave you with lasting memories of your villa holiday. Sitting in the eastern Mediterranean Sea, Cyprus shines with a colourful diversity and culture. It basks in year-round sun and tempts holidaymakers with its range of beaches, natural landscapes, attractions and delicious cuisine. A villa holiday here promises to excite and rejuvenate those of any taste, as you escape the gloom of the late winter in favour of delightful balmy sun. Coral Bay stands out as one of the most tempting retreats for your Cypriot adventure. This resort has everything to make a perfect villa holiday. Modern bars and local restaurants sit alongside stunning beaches and inviting ocean. If you love the idea of exploring the underwater world, head to Amphitheatre Diving Site located here. Or perhaps you’re feeling like hopping in your hire car for a day trip? Opt to explore a little further afield with the capital of Paphos just a short drive away. Alongside Cyprus’ famed soft sandy beaches and tantalising coastline, the country boasts a rich history. You’ll have the freedom to delve in and explore a range of archaeological spots which remain in impressive condition today. The Pafos Archaeological site, known widely as Nea Pafos (New Paphos), was founded in the late 4th century BC. During your visit here, admire the detail of colourful mosaics influenced by Greek mythology. Cyprus is uniquely located at the crossing point of three continents - Europe, Asia and Africa. This influences its enviable climate, and also attracts birds from all over the world. Mountainous terrain towers above untouched woodland, providing the ultimate backdrop to your discoveries. If you’re feeling adventurous, explore the cycling routes and walking trails which open up a world of possibilities. Cyprus truly has something for everyone, and promises to take your breath away from the moment you arrive on your March villa holiday. Maybe March just isn't for you? Head off on a February villa holiday and start your getaway sooner, or maybe our April villa holiday destinations will be more tempting?